When searching for a Subway Peanut Butter Cookie recipe I discovered a delicious Peanut butter cookies that happen to be chewy! The fat in the recipe can be substituted for butter, margarine (cheaper alternative) and perhaps even shortening. I had used margarine the last time I made these and did notice a softer texture in the cookies, unless because they were refrigerated. And that does kind of makes sense since margarine does tend to be softer than butter even when refrigerated. These chewy and delicious peanut butter cookies should be a staple recipe, if you are a fan of peanut butter and this recipe is defiantly a great one to have! 1. Mix the butters and sugars until fluffy. Add egg and vanilla and beat together. 2. Combine dry ingredients and add to the butter mixture; then mix well. 3. Scoop out dough (I used a 1 1/2-inch scoop) onto a baking sheet and bake in a 400 degree F oven for 10-12 minutes. 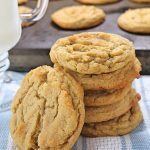 When searching for a Subway Peanut Butter Cookie recipe I came across a delicious Peanut butter cookie recipe that happens to be chewy! Mix the butters and sugars until fluffy. Add egg and vanilla and beat together. Combine dry ingredients and add to the butter mixture; mix. Scoop out dough (I used a 1 1/2-inch scoop) onto a baking sheet and bake in a 400 degree F oven for 10-12 minutes. Oh nice! Thanks for the feedback Miranda!